At Wednesday's Board of Public Works meeting, Treasurer Nancy Kopp, Lt. Gov. Boyd Rutherford and Comptroller Petter Franchot. Photo by Governor's Office. Comptroller Peter Franchot and Lt. Gov. Boyd Rutherford, standing in for Gov. Larry Hogan, once again criticized state agencies’ procurement processes at the Board of Public Works meeting Wednesday, challenging a Maryland Transit Administration health insurance single-bid contract for $634 million. The board ultimately approved the contract to incumbent provider CareFirst in a 2-to-1 vote, following extended debate on the agency’s bidding process. Franchot voted against the measure with an “emphatic no,” he said, citing the agency’s “highly irregular” process. Treasurer Nancy Kopp, along with Rutherford, voted yes. In the past, Hogan, a Republican, has voiced his dissatisfaction with sole-source contracts and contract extensions given to incumbent companies. Following his lead, Rutherford sharply questioned the transit authority over their lack of other bids. In 2014, the transit authority initially put out a request for proposals for a health insurance contract. After collecting bids, the transit authority awarded the contract to Cigna, but later rescinded it after discovering their initial request for proposals was “fatally flawed,” Anna Lansaw, director of procurement for the Maryland Transit Administration, said Wednesday. The second, amended request for proposals, released this year, was awarded to CareFirst, which has provided MTA with insurance for at least 15 years. Cigna did not bid. Cigna was “shocked and disillusioned” following the unexpected rejection from the MTA, its lobbyist Bruce Bereano said during the meeting Wednesday, and was left without time or resources to craft an additional bid. The company requested a third bidding opportunity, during which Cigna would again submit a proposal. Kopp and Rutherford voted to approve the CareFirst contract, effectively denying both Cigna’s request and a suggestion from Franchot to postpone the vote to the next meeting. Rutherford later raised additional concerns over contracting processes while examining the University System of Maryland’s batch of contracts up for approval in Wednesday’s board agenda. The University of Maryland, College Park had three projects up for funding approval — all of which called for 30% of subcontracts to go to businesses owned by minorities. In their proposals, the three projects specified 7% of those subcontracts should go to African-American-owned businesses and 4% to women-owned businesses. Rutherford highlighted this pattern, questioning whether the university system was evaluating each project individually and properly fulfilling state requirements to hire businesses deemed Minority Business Enterprises, or MBEs, which are small, minority- and women-owned firms. Bill Olen, executive director of design and construction at the university, said that between two contracts — the A. James Clark engineering building project and the renovation of H.J. Patterson Hall — only five of the total MBE subcontractors were the same. Both College Park projects, though, are below the projected 30 percent minority business participation levels set in their initial contracts: the Clark construction project has 14.8% and the Patterson renovation is at 13%. The goal is for contracts statewide to achieve 29% minority business participation; fiscal year 2014 saw 27.3% overall. University President Wallace Loh, from the College Park campus, was present at the meeting but not called before the board to discuss the campus’ approach to minority business participation. The spotlight on the University System’s minority business enterprise participation follows a Board of Public Works report, released on Sept. 30 in conjunction with the Governor’s Office of Minority Affairs, that focused on the state contract with no minority business participation, more than half of all contracts. Such contracts increased in number from 246 in fiscal year 2013 to 371 in fiscal year 2014. The percentage of these contracts in relation to the number of overall contracts has remained consistent, the report said. As the number of overall contracts grew, the number of those with 0 percent minority business participation rose as well. The contracts made up 53% of total contracts in fiscal 2012, 56% in fiscal 2013, 55% in fiscal 2014 and 56% in fiscal 2015. The university plans for the “New Cole Field House” include an indoor football practice facility, entrepreneurship center and sports medicine research center. Demolition is slated to begin in the coming weeks and the expansion is scheduled for spring. According to documents submitted to the board Wednesday, the university has collected $40 million of the university’s goal of $147 million in donor funds. Campus officials are expected to come before the board in the future and request the award of bid packages and remaining fees. Franchot started Wednesday’s meeting by addressing a lack of air conditioning in some Baltimore County Public Schools. 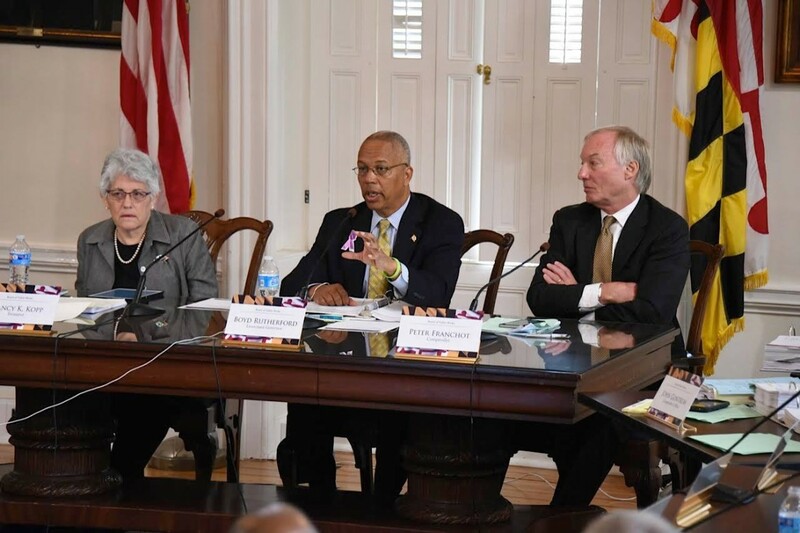 Tuesday night, Franchot, who had criticized the county two weeks ago on this same issue, hosted a town hall meeting in Arbutus to hear the public’s thoughts. Baltimore County Executive Kevin Kamenetz, who was not present at the meeting, announced his intention Tuesday to request accelerated funding from the state in order to install air conditioning in county schools by December 2019. Without the quicker distribution in funds, it would take until 2021, according to a county press release. The board also put on hold a Kamenetz-sponsored project to sell the North Point Government Center to a private developer for mixed use project. The government building is a former junior high school built with state funds, so the state must approve the deal which had caused staunch opposition in the Dundalk community. PAPER BALLOTS: A $97,125 retroactive contract regarding the installation of paper ballot technology, an addition to the original two-year contract of $28,142,662, for the State Board of Elections. The transition from electronic to paper ballots dates to 2007, when the General Assembly passed legislation requiring a paper record for each vote cast in elections. Lack of funding delayed the switch, but officials expect the new technology to be in place by April’s primary elections. HIGH SCHOOL EXAMS: The Maryland Department of Education’s revised contract recommendation, which removes the April test date of the High School Assessment exam. The April exam, according to the department, is not cost-effective and does not align with the schedule of the newly introduced Partnership for Assessment of Readiness for College and Careers, or PARCC, exam. According to the proposal, the October, January and May test dates would remain unchanged. Emotions ran high and discussions ran long as the Board of Public Works approved $7 million in Baltimore County school renovation projects – but not a cent of it going toward air conditioning in old schools. Comptroller Peter Franchot voted against the projects because he felt the lack of air conditioning in 65 of the 172 county schools should be the district’s top priority.